Sometimes all you need is a little bit of chicken and potatoes to turn your ordinary Saturday night into a home-cooked Sunday supper with your family. Last Saturday night when the rain poured and the wind blew, I knew soup couldn’t cut the cold of winter; only starches would do. 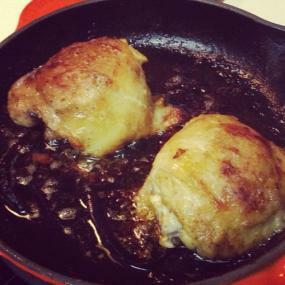 A few years ago I created an oil and lemon dipping sauce for a bread appetizer that I soon realized would taste even better on some chicken. So pull out your cast-iron skillet and gather your loves, it’s time for a little hunger happiness. 1. Preheat oven to 375 degrees. In a bowl, mix together evoo, garlic, black pepper and salt. Before juicing lemons, zest the outer rind and place in bowl along with lemon juice. 2. Marinate chicken thighs in lemon pepper mix for 5 minutes then place covered in refrigerator for 1 hour. 3. Sauté chicken over medium-low heat in a cast-iron skillet for 5 minutes, then place in oven for 25 minutes or until chicken is cooked all the way through. 1. Preheat oven to 375°. Coat a 3-quart baking dish with 1 tablespoon butter; set aside. 2. Heat butter over medium heat. Sauté onion and garlic with salt and pepper for 2 minutes. 3. In a separate pot, bring bay leaf, cream, milk, salt and pepper to simmer until thickness to an almost gravy. 4. Place potato slices on bottom of pan and add half of onion and garlic mixture on top. Pour half of cream mixture on top. Repeat with potatoes, onion and garlic and cream mixture. Top with goat cheese. 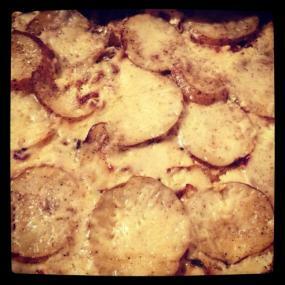 Cover gratin with foil and bake for 55 minutes.